Seasonal Sweets, Top Ten Foods in America, Mac 'n Cheese Changes & MORE! Seasonal Flavors! 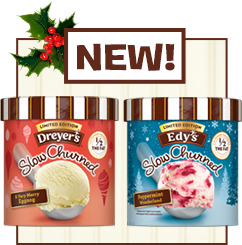 Dreyer's/Edy's Limited Edition Slow Churned Light Ice Cream - Are you ready for holiday ice cream? These wintery picks are in freezer cases nationwide, but only through the end of the year! In A Very Merry Eggnog and Peppermint Wonderland, a 1/2-cup serving has 100 - 110 calories, 1.5 - 3.5g fat, 35 - 40mg sodium, 17 - 19g carbs, 0g fiber, 13g sugars, and 2 - 3g protein (PointsPlus® value 3*). Just watch those portions! POM POMS Wonderful Fresh Arils - Although it isn't that difficult to break down a whole pomegranate, sometimes we want to snack on the juicy fruit with zero effort whatsoever. Enter POM POMS! The resealable containers of ready-to-eat arils even come with little spoons. Talk about convenient! Each 4.3-oz. container has 100 calories, 1g fat, 20mg sodium, 20g carbs, 6g fiber, 9g sugars, and 2g protein (PointsPlus® value 0*). Get your fill now, because they're only around through January! 1. Sandwiches - We're big on sandwiches too, but the carby calories can add up FAST. Click here for our Sandwich-Shop Survival Guide, and check out the recipes from the "Big Sandwiches" episode of Hungry Girl! 2. Fruit - YAY, FRUIT! Some of our fruity BFFs? Fuji apples, raspberries, and strawberries. 3. Vegetables - Way to go, America! Click here for snack tips, and click here for Comfort-Food Veggie Swaps. 4. Carbonated Soft Drinks - Keep the bubbly stuff calorie-free with options like the Coca-Cola Zero line (as in Coke Zero, Sprite Zero, etc.) and stevia-sweetened Blue Sky Zero Calorie soda. 5. Milk - Skip the whole milk... Fat-free dairy milk is good, and our favorite flavorful swaps are great! Click for the 411. 6. Coffee - Java drinks can become calorie catastrophes if you're not careful. Click for an HG guide to guilt-free coffee. 7. Potatoes - Spuds are surprisingly diet friendly, as long as you prepare them right. Check out the recipes we developed for the US Potato Board. 8. Salty Snacks - It's easy to go overboard with these. Click here for some great portion-controlled snack options! 9. Fruit Juice - You might be surprised to learn juice can have as many calories as regular soda. Click for more on this subject, including our low-calorie picks. 10. Cold Cereal - Here's a rundown of amazing guilt-free favorites... And check out this super-sized cereal bowl! If you rely on coffee to get you going in the morning, you may want to delay that cup o' joe. 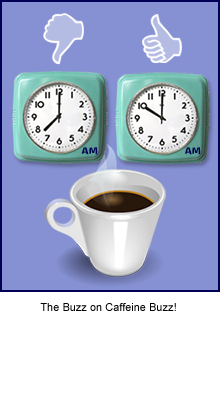 Scientific findings suggest the caffeine in coffee is more effective later in the a.m. hours than it is bright and early! Apparently, our levels of a hormone called cortisol are higher when we wake up, and drinking coffee at that time can lead to a tolerance for caffeine. Fascinating stuff, science peeps! ***Have you been over to Corner Bakery's website lately? It's easier than ever to find a meal that fits your calorie budget! Add up your meal total in the Nutrition Calculator; shuffle through the 100 combos under 600 calories; or select a category in the Menu & Nutrition section, and set filters to edit out individual items beyond your calorie preference. (The filter function also addresses dietary needs with vegan dishes and gluten-free options.) Very nice! ***Kraft Macaroni & Cheese is getting a nutritional makeover... some kiddie varieties, anyway! Starting early next year, the fun-shaped products will have more whole grains, lower sodium counts, and less saturated fat. And that classic orange color will come courtesy of spices rather than artificial food dyes. Pass the SpongeBob cheesy mac! ***We all know that age ain't nothing but a number… but how would you like to calculate your FITNESS age? Punch in your personal stats here, and get the number. VERY cool! And that's all we've got. HG out! Eggnog ice cream? Chocolate coffee creamer?? Click "Send to a Friend" to share the news!!! Today, November 11th, is Veterans' Day. As a thank-you to all the women and men who've served the USA, a slew of restaurants are offering free meals to vets. AWESOME!